The education programs at Tommy Thompson Park provide unique opportunities to experience the phenomenon of migration, explore Toronto’s urban wildlife habitats, and more. For information on Toronto and Region Conservation Authority (TRCA) education programs at other outdoor sites, CLICK HERE. Bring your students on a field trip to Tommy Thompson Park! We bring the experience to you! For school or community groups who would love to learn about environmental and nature-themed topics, but can’t make it to Tommy Thompson Park, we will send a Tommy Thompson Park instructor to your school or centre. Students will become Animal Detectives as they explore Tommy Thompson Park’s trails looking for animal clues. What types of animal evidence can we look for based on their various characteristics? Depending on evidence observed, concepts may include animal life cycles, seasonal behaviours, what human animals can do to protect other animal habitats, and more. By solving a soil mystery, students will learn about soil components and the impact humans can have on soil characteristics required for plant growth. Soak up the wonder of wetlands by immersing your class in an incredible story of the significant habitat restoration taking place at Tommy Thompson Park. This program provides a unique opportunity for students to experience wetlands first-hand and better understand their importance in our health and the health of our environment. It enhances any unit plan focused on biodiversity or habitats. This program invites students to become immersed in the phenomenon of bird migration and develop a deeper understanding of the importance of urban wilderness. Students will be actively engaged in activities designed to hone their observation and data collection skills. When weather conditions permit, students have the exclusive opportunity to examine migratory species at the Tommy Thompson Park Bird Research Station and observe staff and volunteers who are carrying out their daily monitoring and bird banding activities. PLEASE NOTE: This program is available mornings only. This program provides a unique opportunity for students to better understand the urban wildlife that lives in their neighbourhoods and would enhance any unit plan focused on biodiversity or habitats. Visiting groups will explore the diverse habitats and communities that make up Tommy Thompson Park. An interactive hike engages students in an investigation of biodiversity, an in-depth look at pollinators, and a reflection on the impacts of human activity on natural spaces. Weather permitting, students participate in an on-site stewardship project to help Toronto and Region Conservation Authority (TRCA)’s habitat restoration efforts. This program encourages students to offer conclusions based on their own observations of natural habitats and strengthens students’ understanding of the importance of pollinators to their everyday lives. Students will investigate meadow communities at Tommy Thompson Park, specifically exploring the role pollinators play in maintaining healthy habitats. This program can accommodate up to 25 students, and 4 adults. Please note, Pedal the Spit is available as a half-day program only. If you wish to incorporate the quadcycles into a full-day experience, see the Quadcycle Program Add-on information below. The Aquatic Plants Program is a free, curriculum linked, hands-on educational experience. The goal of the program is to increase students’ awareness of the value of wetland and other ecosystems in maintaining the ecological health of our region. By growing and transplanting native plants from seed, and participating in activities, students will learn to care for their environment through local habitats. This program involves daily student commitment to care for plants in the classroom as they grow. Spaces are limited. NOTE: To receive notification of when registration becomes available, please contact rraudsepp@trca.on.ca. If you’d like to bring your students or group to Tommy Thompson Park for a simple nature walk, habitat exploration, restoration tour, or birding hike, please contact us! We’d love to share the wonders of Toronto’s Urban Wilderness with you and your group! Custom Programs are available year-round. Call TRCA Visitor Services at 416-667-6295 or email VisitorServices@trca.on.ca, unless otherwise stated above. 2 hours: 10 a.m. – 12 p.m. or 12:30-2:30 p.m.
4 hours + 30 minutes on-site for lunch: 10 a.m. – 2:30 p.m.
Groups must arrive by school bus which needs to stay on-site for the duration of the visit. Our programs take place in the park’s interior over 2 km from the gated park entrance. The park is located at the foot of Leslie Street, south of Lakeshore. Arrive to the park by TTC and ride our quadcycles into the park to our program area. Students will put sustainability into practice! Available with full-day program option only, for groups of up to 25 students + 4 adults. Quadcycle add-on cost: $80 +HST (if applicable). Development of the Winged Migration, City Life, Wildlife, and Pollination Investigation programs was generously supported by TD Friends of the Environment Foundation. Birds are all around us — but how well do you know them? In this session, participants will find out just how fascinating our feathered friends are. Focusing on bird species found in Tommy Thompson Park and elsewhere in Toronto, participants will explore the world of birds through sight and sound, discovering what makes them unique! Why are wetland habitats in Toronto so important? Through games and activities, participants will learn what a wetland is, why it matters, and how we can be part of wetland conservation. Let’s discover the world of wetlands together! Learn about the wildlife we share Toronto with! Participants’ understanding of local urban wildlife will grow through activities, games, and an opportunity to explore fur and skull replica specimens. An emphasis will be placed on the concept of sharing the city space with wildlife, ensuring their needs are met alongside ours. Discover microplastics, a significant environmental issue affecting aquatic ecosystems across the globe. Participants will analyze terrestrial samples from Tommy Thompson Park and aquatic samples from the Toronto harbour. Through an in-depth presentation and hands-on exploration, participants will gain an appreciation of the impacts of our daily plastics use and discuss approaches to being part of the solution. Microscopes and sediment sorting sieves provided. To book the Microplastics program, please contact Raja Raudsepp: rraudsepp@trca.on.ca. Call TRCA Visitor Services at 416-667-6295 or email VisitorServices@trca.on.ca. Programs are 2 hours in length. Spending time in nature can enhance one’s sense of well-being. Natural Minds — Lasting Connections was a 2016 pilot program that worked with communities of Torontonians living with mental illness to grow relationships with nature, offering excursions in outdoor park environments — specifically Tommy Thompson Park. Individuals interested in initiating their own guided walks took part in a Nature Ambassador Training Program, gaining skills and knowledge to positively impact fellow community members in the future. The program offered a means for people to strengthen connections — with other people, and with our natural environment. Strategies are being explored to grow this program. For more information, contact Raja Raudsepp at rraudsepp@trca.on.ca. 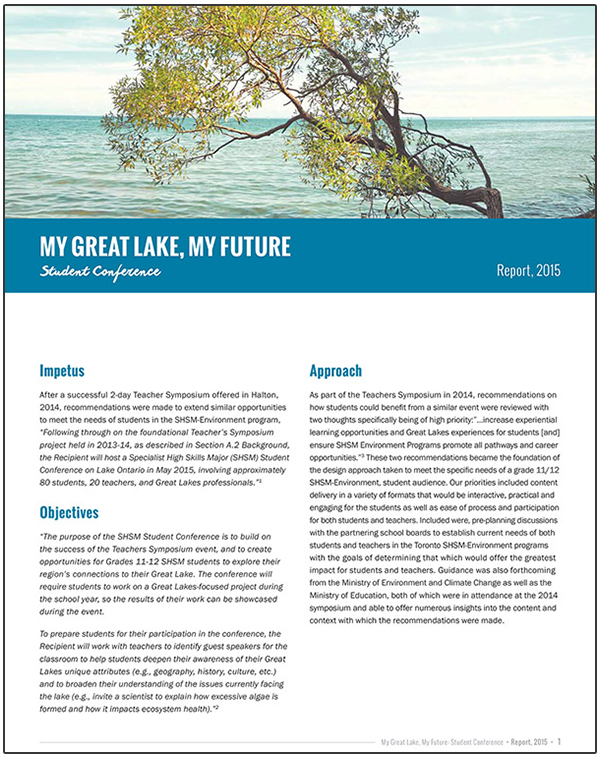 Tommy Thompson Park, in partnership with Harbourfront Centre, hosted the first annual My Great Lake, My Future Student Conference for SHSM-Environment students in Toronto school boards on May 7, 2015. Interested in holding a similar event in your region? see the Event Planner.